First Balsa Build Ben Buckle Taylorcraft 48 or Mini Super 60 or a piper cub? Can someone tell me what each is like to fly/build? also which would be better? The mini super 60, is more of a trainer Thomas, as it was designed for stability and succeeds there. The Taylorcraft, if anywhere scale, is more "intermediate" and a tad more tricky, as a Cub would be. Thanks for the message - So at the mo, I have a tiny 34inch hi wing electric foamie, a bixler 2 (sits around 56inch) and a 64inch highwing cessna.. I am looking for something around the 48inch mark as a step up towards the Cessna. What is tricky with the Taylor craft? Of your two choices, I would recommend the Mini Super 60. It will be very easy to fly. It's a long proven trainer design. Balsa builds do not get more traditional than this. It is quite easy to build. If your Cessna is quick then it would likely be a good halfway house between bixler and cessna. edited to remove a question you've already answered. I would agree that the Mini Super is the way to go. The kit is very simple to build and you are learning a new skill. THat will be enough to worry about for a start (Well, not worry, it is too simple) It will also be easier to repair. The orginal was a great model. I built one in the 60s or 70s and flew it on single channel radio. I'd give the Piper Cub a miss for now Thomas. The Cub isn't usually deemed suitable as a trainer. Certainly those I've flown over the years could never be used as trainers. 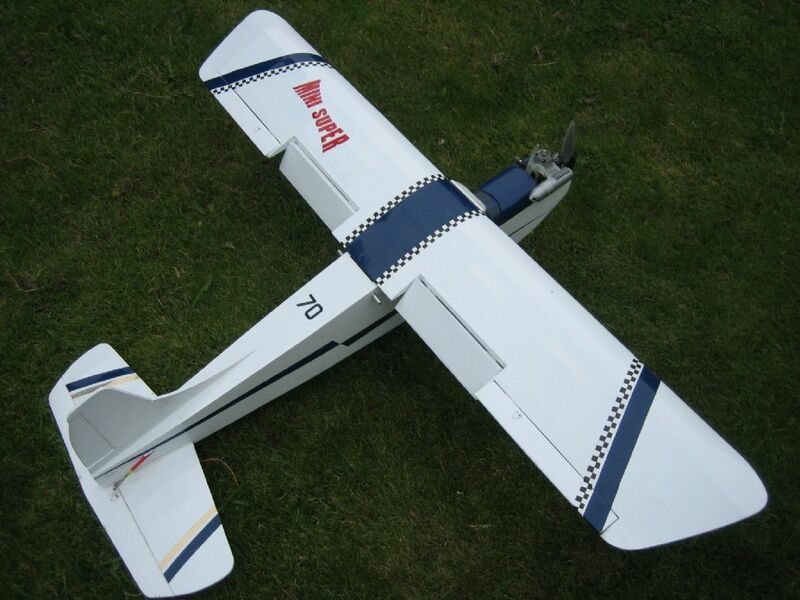 Mini Super is the one, this is mine modified with ailerons and flaps, very stable and easy to fly. Just good luck and guess work,no drawings involved. I have just refurbished it again, made the ailerons the same width as the flaps as the narrow ailerons did not have much authority. If you do build the wing with ailerons and flaps you must reduce the dihederal approx.1" max under each tip. I had a Mini Super as my second plane. I found it to be reasonably aerobatic. It has no ailerons as standard, but there's nothing to stop you fitting some. I didn't use ailerons then. Without them, rolls were pretty easy using the riudder and elevator, but I prefer the control you get with ailerons. I wouldn't describe it as a particularly stable plane. With the power on, it was very lively - not at all like the Super Sixty, though it's fairly docile when you throttle back. IIRC, mine had an OS 15 FP in it. It's a pretty straight-forward plane to build. Everything is standard balsa construction. Mine was the original KielKraft kit. I don't know whether the BB kit has any differences. Thanks for the information - I am going to be having it setup as Electric - so what would the equiv electric power be for OS 15? Also is there some resource online that details the Aileron wing conversion? - a marked up standard wing for instance? Anyway today I ordered the Mini super - so should receive it next week - let the fun begin, although can't start it until I have upgraded one of my 3D printers to dual material. Mine is a tail dragger built from a free plan,don't know which designer!! The BB plan has trike fixed wheel u/c. Jim, it was probably this plan from this mag article . Jim, what does your Mini Super weigh, as I can't find what the all up weight should be? Thomas, regarding an equivalent motor to a 15 IC engine, I suggest this might be an option using a 3s 2200-3000mAh LiPo and prop it to pull about 25-30A, although others might have a more informed suggestion? Alternatively give George Worley of 4-Max a ring and ask him what he would recommend. Never did weigh it but later this morning I will put the MK11 version together and see how much it weighs. MK11 mods ---- Tailplane now on top of fuzz and a full size rudder added. 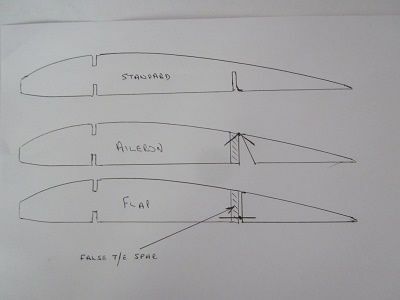 this is the basic mod for the ailerons and flaps,not much of an artist so I hope it makes sense,feel free to ask Peter Miller any questions. All Forum Topics > Beginners > First Balsa Build Ben Buckle Taylorcraft 48 or Mini Super 60 or a piper cub?